Augmented Empire is a story-driven RPG set on the island of New Savannah, an isolated neo-noir city divided into three tiers by the ‘Citizen Grade System. ‘While the citizens deemed of high societal value live in luxury at the summit, outliers and criminals are forced to live in squalor at the island’s depths. 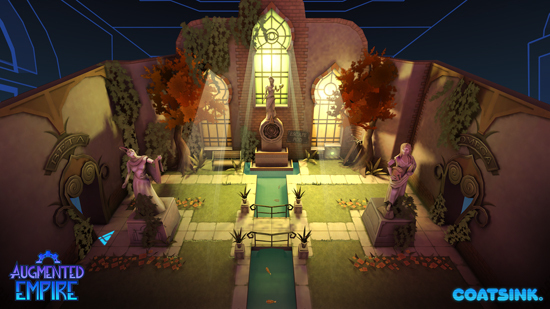 From the armchair of their secluded hideout, the player uses simple look-and-click controls to instruct their team of 6 augmented misfits in a world rendered as an ‘augmented reality’ diorama before their eyes while interacting with the office around them to investigate new developments, make calls and develop the skills of their team. Battle law-makers and law-breakers alike to mastermind the revolution. Who will control the Augmented empire? Augmented Empire will be launched exclusively on Samsung Gear VR Powered by Oculus in Summer 2017 with Gear VR controller support.